After a short break I'm back in the same seat for the final session of the day, which is a live webcast directly from Google's campus in Mountain View. As the developer day in London draws to a close the one in Moutain View is just kicking off and, along with everyone else here in London, I'm currently listening to the opening keynote from California. Funnily enough they're saying many of the same things, in the same way, as we heard this morning during our own opening keynote. Consiering how much fun some of the rest of the day has been, this seems to be a bit of an anticlimactic end to the day. Update: Okay here we go, we've got some product announcements. The first announcement is Google Mashup Editor, which apparently does what it says on the tin and lets you build simple mashups with a few clicks. Update: Next up they're talking about Mapplets which we heard about earlier. I'm guessing I was in the wrong parallel session to hear about the Google Mashup Editor perhaps? Update: I actually think our own keynote was a lot better than the Mountain View keynote, which seems to be very heavily scripted and with the talking heads obviously not being that used to public speaking. This certainly isn't a Steve-note like performance from Google. But maybe there will be one more thing? Update: Now covering the Google Web Toolkit and now Google Gears which we've also already heard about and the new offline version of Google Reader. Update: They've just rolled on the CTO of Adobe to talk about Google Gears and Apollo. I haven't seen a demo of Apollo before, and I'm actually quite impressed especially with Gears integration it looks interesting to manage easy cross-platform development. Update: Okay, we're wrapping up at the end of the keynote. It doesn't look like there is one more thing, alhtough they have just rolled Sergey Brin onto the stage. So I've actually had to get off my seat and move through to one of the other theatres for my next session, which is Developing for the Mobile with Gummi Hafsteinsson. Looks like my back-up battery might be enough to see me through the rest of the day, but it's going to be close. I still can't believe there aren't any power sockets here? He went on to talk about the complexity involved in the mobile market, the large number of browsers that tend to render things differently, and the huge number of handsets with different capabilities. But the thing we're supposed to take away from the talk is that we should, "Ignore the complexity and try and keep it simple". However a good rule of thumb is that since most of the mobile browsers are XHTML not HTML, if your markup isn't standards compliant then it probably won't be rendered at all. Unlike the "desktop" web its unlikely that sloppy markup will work. This also means that you need to specify you character encoding specifically because the browser probably won't guess correctly. Another interesting point he's trying to hammer home here is that the way people use the mobile web is very different than the "desktop" web. People generally don't type URLs into a mobile browser, so if your site isn't indexed by a search engine (or is well known and has a short URL) then people probably won't use it. You also need to take account of the small amount of processing power available on the client side, you really need to sclae the images on the server rather than client side and have a maximum image width of 120 pixels by default. The other thing to focus on is what people are actually going to use your mobile site for, after all you probably don't want to do the same things from your phone than you do from your desktop. Next he's really insistant that you do your testing on actual handsets because the emulators don't reflect what really happens when you put the site onto real hardware. However you shouldn't be tempted to exploit the capabilities of the new advanced phones without good reason. Don't do optimisation unless it gets you real functionality for your predicted user base. If you are pushing financial data and your users mostly (all?) have a Blackberry then it makes sense to optimise for that handset, but otherwise it's probably not worthwhile. In summary, you have to develop your site with a good idea of why your doing it and why your users might want to use your site on the move. Finally, keep things simple, and only do customisation if it's really needed. I'm still sitting in the same seat for my next session, looks like my choices were fairly popular as this is the largest of the theatres, which was originally titled "Building better AJAX applications/Newest APIs" which was the obsufcation used to disguise today's launch of Google Gears. So I'm now sitting in a tutorial called "Google Gears: An Open Source Offline Toolkit" given by Chris Prince the Gears Engineer. Gears is basically somewhere in between a full blown web application, and a fully offline native application, but is intended as an incremental approach to supporting offline in web applications implemented as a browser plugin for IE, Firefox and Safari (well, almost)... he says its going to "Do for offline what XMLHttpRequest did for web apps". Basically the applications write to the local database instead of the remote server, and when you go online the changes are written (or read) from the remote server. Basically its analogous to a browser cache, except that the local "cache" is actually the primiary reference rather than the fall-back. Update: ...okay, so Gears look really interesting. I can't help thinking that Gears combined Google Apps equals the long rumoured Google office suite. It answers the main problem with web applications and your data. That being, what happens if you don't have a web connection? Not being able to get to your data isn't really acceptable. I've got a feeling that this is Google's call to arms, and a shot across the bow of Microsoft Office, and it's going to be interesting to see what happens here. Basically people are sitting around here with their jaws hanging open... "You can do that!?". My first real session of the day Andrew Eland talking about the new features in the Maps API. He started off giving a brought overview of the API, but did finally dig down into showing us some real code, starting off with the classic Hello World program in Maps by dropping a marker onto the map as an overlay that when clicked on displays the classic message. Update: He's talking about Mapplets which blends the Google Gadgets and Maps API, which produces a Google Maps API application turned into a plug-in for Google Maps. He's going through the "Hello World" example as a mapplet now, doesn't look too bad, and explaining how the Mapplets are protected against cross-site scripting attacks. Another benefit is that it's a lot easier to add the data as an overlay as Google will handle virtually everything for you. Looks to be a classic case of separation of data and implementation. An easy sell? The kick-off keynote is in two parts, with Chris DiBona giving the first keynote on open source idealisim and the APIs and then Ed Parsons who'll be talking about the Geoweb. He's going on to talk about Google Gears, which is a new too which can be used to make web apps able to work offline, which they're releasing into the big bad world today. Looks like they've snuck it into the Newest APIs session because they were all being secretive and stuff, so I get to have a close look. Chris has handed over to Ed Parsons, fresh in from Where 2.0, who is talking about geography, maps and building the Geoweb. Ed went on to talk about the amount of geographical information and how only a small fraction of it has been indexed yet, and the huge amount of niche long-tail geo-data that is sitting around waiting for people to pick up make accessible. After his overview, he returned to the core product Google Maps and how the functionality of the application is exposed for us to use. He brought us all the way up to date and talked about street view which was only released yesterday at Where 2.0. No open API yet, but it's coming soon. He's also talking about the new Google Mapplets application. From there he went on to talk about Google Earth as a platform, and how the database is open and extensible, and how you can use KML to create and expose content. We're about to break for lunch, I've got pictures, but pushing that much data up to Flickr isn't going to happen with the wireless network in its current state. I'll upload them when the network improves. 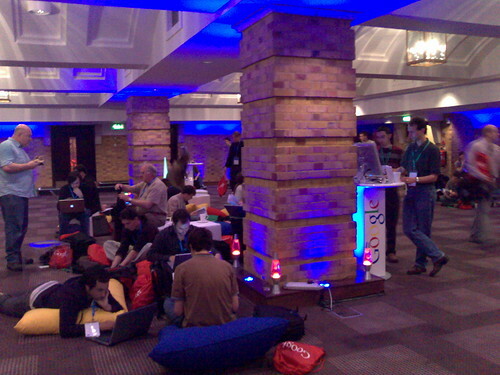 I'm currently squatting on one of the large pillows strewn Blogger Lounge at the Google Developer Day in London. For those of you who didn't manage to talk their boss into letting them blow an entire day to go to this thing, you'll have to make do with the talks that are being streamed to the web. I've managed to get into the New features in the Maps API, Google Earth and the GeoWeb, Building better AJAX apps/Newest APIs and Developing for the Mobile sessions. I'll try and keep blogging as the day goes on, but the wireless internet is starting to creak under the pressure already, and I've got a feeling I'm going to have to fight for a power socket. Update: The Google Keynote given by Chris DiBona and Ed Parsons. Update: The new features in the Maps API session with Andrew Eland. Update: The Google Earth and the GeoWeb session with Peter Birch. Update: The Google Gears session with Chris Prince. Update: The mobile development session with Gummi Hafsteinsson. Update: The webcast keynote, live from Mountain View. Update: Footage from the Google Developer Day is now on YouTube. News from the O'Reilly Where 2.0 conference of the upcoming release of the much predicted Google street side view (via O'Reilly Radar). Of course this isn't new, after all Amazon A9 did this back in 2005, but neither was online mapping applications when Google Maps launched. The question isn't whether they're were first, it's whether their interface is so much better than what's gone before (yet again) that they corner the market. That, and from the sounds of things, whether this gets integrated into Google Earth. However while the guys over at O'Reilly seem to be able to see this on the Google Maps pages right now, it looks like the rest of us will have to wait for the official announcement during Where 2.0 later today. I certainly can't see the new features and from the comments on their post it doesn't look like I'm alone on that one. Update: I can confirm that adding &gl=us (via Lifehacker) to the URL does indeed allow you to use the new features, at least from the UK, and from what I remember it blows the interface for the long defunct A9 service out of the water. The way you can click and drag around your location is actually pretty slick. Update: The guys over at the Google Lat Long blog have pointed us to a video showing how to use the new features. While peer review has been compared to the wisdom of crowds, it isn't the same thing at all. Under the peer review model all people are not created equal, and expert knowledge of the subject area is both necessary and respected by the process. An obvious counter analogy in the Web 2.0 world is Wikipedia, which seems to lack the traditionally respect for expertise, and has suffered a large amount of criticism as a result. Science has been built off the back of the peer review process, and anything which threatens to undermine that has to be looked at very, very, carefully. Not because change is necessarily bad, as scientists we're open to change, willing (hopefully) to throw away long treasured theories if the evidence proves that we've been wrong (or at least not right). But right now, there doesn't seem to be a lot of evidence that the wisdom of crowds will work out better than peer review. For instance several times I've had to explain tagging to my colleagues because of its relevance to the ADS archive or arXiv pre-print server, and been met with exclamations of horror. Instead of promoting interesting research people are afraid that the wisdom of crowds will flatten it, because something is "obviously wrong" valid research will get trampled down before it sees the light of day. Currently the way to bury someones research is to duplicate their experiment and prove them wrong, when it simply becomes a matter of a number of influential people tagging a paper as being dubious, so nobody bothers to read it again, then you have to start to worry. At long last Virgin trains has introduced an on-board picocell on some of their Voyager and Pendolino trains. Of course they've been promising to do something about the appalling mobile phone reception onboard their "new" trains since 2004 when they first admitted there was a problem. Rumours of LED displays and ultra-portables as well as 3G cellular modem are starting to circulate, along with predictions of an "ultra-portable" replacement for the 12-inch Powerbook to arrive with Leopard around the end of the year. Of course, we've been here before. Like the iPhone, which we talked about for over two years before it saw the light of day, we've been talking about a new hyper-portable for more than a year now. Predictions of an "instant on" laptop have been doing the rounds ever since the switch to Intel did away the 12-inch Powerbook and no replacement appeared on the horizon. Well I've had my complaints about the new Blogger, but as you may have noticed I've decided to stick with it. I've just completed the move to Blogger for custom domains. This explains the domain name change for the blog, although if you're subscribed via my feed you might not even have noticed that yet. I'm using Apache's Rewriting Engine to redirect traffic from the old URLs to the new site. However despite having switched to the new Blogger some time ago, it looks like the canonical URLs for things like archive and label pages moved during the switch over, as did the location of the RSS feed which gave FeedBurner no end of trouble. Hopefully I've caught all the corner cases, but if someone does spot something I've missed, mail me and I'll fix it. So if you've come to the blog via a link to babilim.co.uk, update your bookmarks, and I hope you like the new look and feel. Update: In a curious coincidence, the guys over at Blogger have just announced that they've finally taken the old Blogger system off line and dismantled the hardware. Apparently Costco has started selling Mexican Coca-Cola (via kottke.org), which is made with sugar instead of corn syrup, in some of its stores in San Francisco. With Yahoo announcing the closure (via TechCrunch) of Yahoo Photos service in favour of their recently acquired Web 2.0 poster boy Flickr, you might imaging that users of the old service might be left in the cold. Or at best force migrated to Flickr? Not so, instead users are being encouraged to export their data and migration paths to several other competing services such as Photobucket, Snapfish, Kodak Gallery or Shutterfly. Although of course there will be a on-click solution to migrate to Flickr. So after initially pulling stories on the HD DVD encryption key being cracked, Digg has bowed to pressure which brought the site to its knees yesterday and stopped censoring stories on the topic that include the keys. Considering how much of a nothing this is, the key is out in the public domain now and anyone that would actually know what to do with it can find it if they want to, the amount of publicity this has generated is astounding. You only have to look at Google News or Digg itself, to see how much fuss this has kicked off. But the question is, will the MPAA AACS be stupid enough to prosecute and will Kevin have to go down fighting? Or can even the MPAA AACS see when the jig is up...? Do they really think they can put the genie back in the bottle? Update: I guess it doesn't look like it, does it?